Besides being a meaningful pursuit in and of itself, a valuable education will also open the door to gaining skills and experience that otherwise simply wouldn’t be as obtainable. That’s right. In 2013 the median weekly paycheck for a full-time worker with a high school diploma was roughly 38% greater than someone with anything less. Now let’s compare that with someone with a Bachelor’s degree: a full-time worker with a Bachelor’s degree makes roughly 70% more than someone with just a high school diploma, and about 135% more than a high school dropout. It’s also worth some time to think about the unemployment rates listed above. 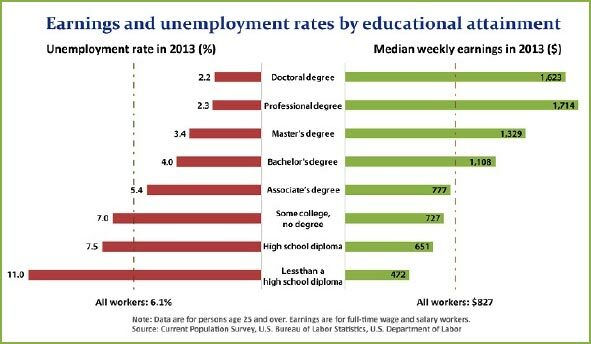 11% of people 25 and over in the U.S. with less than a high school diploma were unemployed last year. That unemployment rate drops dramatically for those with a diploma, and keeps decreasing without exception as the level of education increases. There are some that say that roughly 590 out of 773 statistics are made up randomly on the spot– but let’s face it, the data I’ve shared reflects common sense. We already know that more opportunities are available for those that strive and struggle to receive a valuable education. The evidence is overwhelming, and to try and become the “exception” is an irrational risk. If you want to make more money, you have to go to school, learn a trade, get certified, and get on with it. Let’s face it, we don’t like spending lots of time doing things we don’t like, and we don’t like spending lots of money for things that aren’t worth the price. I believe that everyone should focus their educational goals towards something they love and value. But I also believe in being economical about it—don’t drown yourself in debt just to invest your time and energy into something that won’t return and exceed the price paid! So before you study, study. Research certifications, degrees, jobs, and career paths to make sure your investment will be worthwhile. We live in one of few countries where an education is virtually available to anyone and everyone that sacrifices to obtain it. I'm a bilingual recruiter. I have a Bachelor's degree in Commercial Spanish and am continuing my academic career studying International Economics. I'm passionate about air guitar and grilled cheese sandwiches.